Below is a very brief overview of the line of development of the Science of Christian Science (edited excerpts from Max Kappeler The Development of the Christian Science Idea and Practice, 2nd edition, pp. 8–14). It is not easy to determine how much Mrs. Eddy was aware of concerning the divine system that she received through divine revelation and that she stated in her Textbook, Science and Health with Key to the Scriptures. We only know that she was an eager student of her own book, that she was often amazed at what “this woman” wrote, and that when writing Science and Health she little understood all that she had indited (see My. 271:4–5). She also declared that she had been “learning the higher meaning of this book since writing it” (My. 114:26), concluding her Textbook by referring humbly to her understanding as “the writer’s present feeble sense of Christian Science” (S&H 577:28). Regardless of Mrs. Eddy’s level of understanding of the scientific system of Christian Science, this could not hinder her from transcribing what God had revealed to her (see Mis. 311:26–29), and from being “a scribe echoing the harmonies of heaven in divine metaphysics” (My. 115:7). It is characteristic of inspired spiritual revelators that they give to those of their time only as much as the people have strength to bear. Jesus said: “I have yet many things to say unto you, but ye cannot bear them now” (John 16:12). Likewise, Mrs. Eddy knew that only future generations would be able to declare precisely what she had discovered. In Science and Health, under the marginal heading “A higher discovery,” she prophesies that her spiritual discovery “will gather momentum and clearness, until it reaches its culmination of scientific statement and proof” (S&H 380:26). She knew that Principle’s interpretation of itself would go on unfolding and, consequently, that Christian Scientists must be open to further insight into the scientific structure of their Textbook and must welcome it. Mrs. Eddy makes some very direct allusions to the future development of her discovery. In 1887, in “Caution in the Truth,” she explains that her discovery was, to her, divine Science, the Science of spiritual harmony, but that the age in which she lived could conceive of it only in its reduced sense as “the Science of physical harmony” (Un. 6:10). Yet she prophesied that when “the platoons of Christian Science are … thoroughly drilled in the plainer manual of their spiritual armament … in less than another fifty years [mid 1930s] His name will be magnified in the apprehension of this new subject” (Un. 6:25–7:2). This has actually taken place. Principle’s uninterrupted impulsion to explain itself in its Science (stated as Science and Health), went on unceasingly, using that mentality that was made ready for the understanding of the constituents of the Science of Christian Science. Having grasped the idea of the oneness of Being—that Principle and its idea is one—John W. Doorly, C.S.B., of England, could see that an apprehension of the oneness of Being cannot be a scientific pinnacle but is, rather, a scientific basis from which to advance. Science means knowledge reduced to law and order and embodied in a system (Funk and Wagnalls Dictionary). Merely thinking in terms of the oneness of Being without understanding its scientific constituents—its laws, orders, rules, classifications, and categories—thought runs wild. The oneness of God needs to be explained in its divinely scientific system. Now the flood-gates of Science were wide open. Scientific revelation flowed in at breathtaking speed. Soon it was revealed that the four sides of the Holy City represent the divine infinite calculus (see S&H 520:10–15), in which the 7 synonymous terms for God operate in 4 different orders as Word, Christ, Christianity, and Science. Furthermore, what constitutes the various levels of Science was revealed—the levels of Christian Science, absolute Christian Science, divine Science, and finally, the level of Science itself (see John W. Doorly, The Pure Science of Christian Science, 1946; Oxford Summer School 1949, Vol. 2, p. 270). The key of the Science of Christian Science was now found, and with this key the Science of the Bible could be unlocked. The Bible took on a new meaning. For the first time in human history, it could be seen that behind each book of the Bible lies a scientific, spiritual order of ideas. Translated from biblical language into a language of Science, the Bible not only becomes a spiritual textbook for today, but also shows its exact consonance with Science and Health in its Science. Doorly published his findings on the Bible in the late 1940s in his Talks on the Science of the Bible. Later on, it was discovered that all the books of the Bible combine into a scientific, spiritual structure, the whole corresponding to the design of Principle itself. Equipped with these spiritually scientific tools, it was then a natural step to discover the scientific structure of the coherent text of the Christian Science textbook itself [see Max Kappeler, The Structure of the Christian Science Textbook—Our Way of Life, Vol. I: Revelation of the Structure]. The spirit of God had used Mrs. Eddy to put into divine order, first, her statements in each chapter in the 50th edition (1891), and then the 16 chapters in the 226th edition (1902), but it was only in the early 1950s that this divinely scientific structure became apparent. From then on, the Textbook, from the first to the last page of the 16 chapters, could be understood as one consistent, coherent, spiritual story—every chapter necessitating the spiritual import of the chapter preceding it, and inevitably impelling the subject of the following one. In this way, the Textbook presents the true spiritual journey of each individual student, “the way of Life” for each one. Science and Health means vastly more than just “the Science of physical harmony”; it presents the Science of Life in its infinite meaning. Christian Science is indeed a way of Life. Today the cybernetic age is dawning on mankind, foreshadowing the acceptance of the Science of all sciences. Whatever progress appears in the human always prefigures a divine idea. A study of the three sets of capitalized terms for God in Science and Health—(1) Mind, Spirit, Soul, Principle, Life, Truth, Love; (2) Word, Christ, Christianity, Science; (3) Science itself, divine Science, absolute Christian Science, Christian Science—makes it evident that when these are understood in their interrelationships, they constitute the basic elements of divine cybernetics. Divine cybernetics deals with the one Being operating as a self-operating divine system that runs on a built-in, self-regulating circuit of error preventing and error correcting dynamics. This development naturally also demands a completely new structure of consciousness for its acceptance. John W. Doorly, London, England (1878–1950) was a well-known Christian Science teacher and practitioner. He was appointed to the Board of Lectureship in 1914, and was President of the Mother Church in 1919–1920. Doorly left the Board of Lectureship in 1929 and for the next 20 years he studied Mary Baker Eddy’s writings and the Bible to find and publicize the reasons for Mary Baker Eddy calling her discovery “Science.” He realized that Funk and Wagnalls definition of Science as “knowledge reduced to law and embodied in system” was totally appropriate to Mary Baker Eddy’s discovery. He became a pioneer in the field of Christian Science, being the first to discern and elucidate as a whole, what constitutes the fundamentals of the pure Science and system of Mary Baker Eddy’s discovery. Doorly discerned the order and system of divine metaphysics implicit in the Christian Science textbook, Science and Health with Key to the Scriptures by Mary Baker Eddy. His recognition and developing understanding of these fundamentals enabled him to use the Textbook to unlock the Bible as a whole, book by book, revealing the timeless Science of Being symbolized throughout its pages. He presented his findings in his classes, books and extensive Talks on the Science of the Bible, published as verbatim reports. This is proving to be a revolutionary and unique contribution to Bible study. For more information on John W. Doorly, see Peggy Brook’s biography, John W. Doorly and the Scientific Evolution of Christian Science, available through the John W. Doorly Trust. 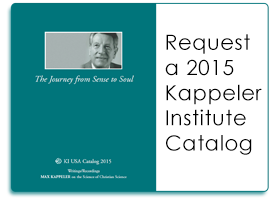 Dr. Max Kappeler, Switzerland (1910–2002), was a dedicated and lifelong student of Christian Science. After completing his Ph.D. in economics at the University of Zürich, he began his pursuit of a more scientific sense of Christian Science, joining John W. Doorly’s research group in 1938. The outbreak of war brought him back to Switzerland, where in 1948, after a successful business career, he felt compelled to devote his entire energies to the research, teaching, and practice of the Science of Christian Science. For over 60 years he wrote books and held classes on this subject in Switzerland, Germany, England, and the United States. His writings have been published in German and English. The uniqueness of Kappeler’s life work was that he built upon the work of his teacher, John Doorly, by elaborating the spiritually scientific laws that underlie the Bible, Science and Health, and the Model of Being. His work thus fully elucidated Mrs. Eddy’s statement, “In the year 1866 I discovered the Christ Science or divine laws of Life, Truth, and Love, and named my discovery Christian Science” (S&H 107:1). The pith of Kappeler’s work is that he defined every spiritually scientific law by its place-value (pedal note) within the divine system, the factors of the law, and the criteria needed to define the law. His pioneering work into the spiritual realm and its universal laws is revolutionary and unprecedented.